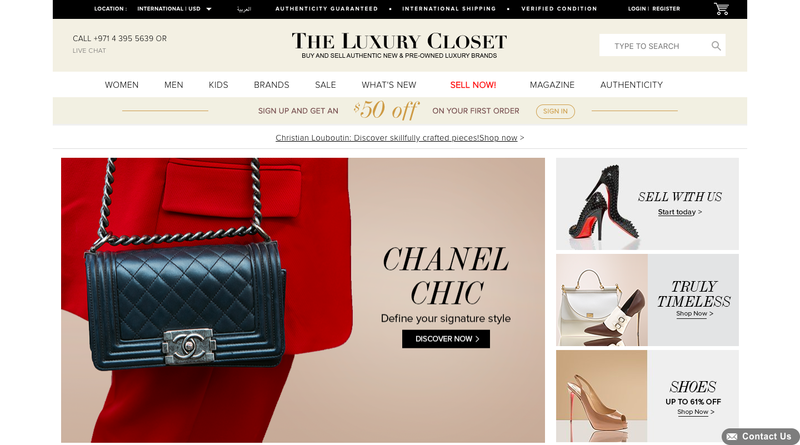 The Luxury Closet is a Dubai-based luxury e-commerce portal that specially focuses on the pre-owned segment. The Luxury Closet, a Middle East luxury resale marketplace, has successfully raised US$8.7 million in growth funding in a round led by existing investors Middle East Venture Partners (MEVP) along with participation from Wamda Capital, Precinct Partners, Tech Invest Com, Saned, and Equitrust. At a time when fundraising concerns dominate the minds of small businesses across the region, The Luxury Closet has managed to steadily raise finances in the market over the years- in April 2015, the e-commerce startup raised $2.2 million in a seed round, and closed a $7.8 million Series B round in October 2016, with its investors continuing to back the startup on its successive rounds. The current funding proceeds, however, are quite different in their utility for the startup’s founder and CEO Kunal Kapoor. “In the earlier investments, the company helped create a solid foundation in terms of bringing the team and the required infrastructure in place, and getting the second-hand model right,” notes Kapoor. “[But] we now have clear metrics and strategy of where the future growth needs to come from, and the funding will allow us to achieve these goals,” he says. The Luxury Closet. Image credit: The Luxury Closet. This brings us to the startup’s key business proposition, which did turn heads when it launched, but one can’t ignore the substantial improvements in the luxury industry since then, with brands realizing the importance of getting online. However, Kapoor believes that perhaps the only way to buy high-end brands at a discounted price today in the region is to buy them pre-owned, and that’s where The Luxury Closet stands out. “We see this as a competitive edge that will allow us to build unique business and a focal point for luxury buyers and sellers across the world. Dubai is an amazing city to start a luxury company, and we hope to expand further outside the region,” he says. Kunal Kapoor, founder and CEO, The Luxury Closet. Image credit: The Luxury Closet. As for the startup’s plans to keep the momentum going, along with an eye on “unlocking the best closets in the region,” Kapoor says they also plan to sign contracts with major retailers in the region, which will facilitate access to supply of new items. “On the demand side, we will grow our international buyer base; for example, the US is a fast growing market for us accounting for over 20% of our sales,” says Kapoor. Seems that sky is the limit for this startup, and we wish them all the best! What are your top tips for the region’s entrepreneurs to secure funding for their ventures? “In terms of tips, I think that what I learned most is that you have to choose a business that has a large addressable market. Going after something small will take much more effort, ending up in a smaller business. The second tip is in creating a team. Great people give you tailwind, and not so great ones give you headwind. It’s key to hire the right people at the right time, while it’s impossible to get it 100% right, it’s an area where you have to make most decisions right. The third tip is to have technology at the core of the business and automate processes once you get them right. I think the combination of the three will make a fast growth business that can run the marathon that’s required."